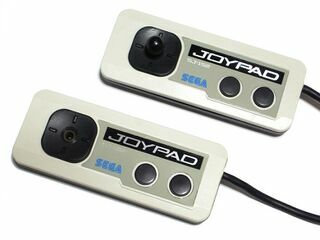 The Joypad (ジョイパッド) SJ-152 is the default controller for the Sega Mark III. It is very similar in design to the SJ-150 and SJ-151 seen in the SG-1000 II. The SJ-152 is less bland than the SJ-151, and the D-Pad is now shaped like a rounded square rather than a circle. It appears that some versions have a removable thumbstick while others do not. Also featured are two unlabled face buttons and a lead that exits the controller at the right hand side. Most of its design features would be passed on to the Master System Control Pad.